A new Pew Research Center survey finds that President Barack Obama’s overall approval rating has held steady at 44%, even as he receives low marks for his handling of the surge of undocumented child immigrants at the U.S. border. While Obama’s job rating has been below 50% for the past year, it stands eight points higher than that of his predecessor, George W. Bush, at a comparable point eight years ago. 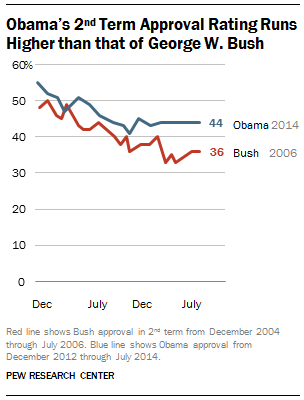 In July 2006, 36% approved of Bush’s job performance. Obama gets much higher marks than his predecessor for empathy and honesty. But his ratings on leadership and his ability to get things done are about the same as Bush’s at about this point in his second term. In the current survey, 54% say Obama “cares about people like me” and 51% consider him “trustworthy.” By comparison, in the summer of 2006 – a year after Hurricane Katrina struck the Gulf Coast – fewer said Bush cared about people like them (41%) and was trustworthy (41%). In August 2006, 42% said Bush was “able to get things done,” while 51% said he was not able to get things done. Perceptions of Obama are nearly identical (44% can get things done, 53% cannot). Similarly, 43% called Bush a strong leader in the summer of 2006, little different from the 47% who say this about Obama today. Independents are much more likely to view Obama as empathetic than they were to view Bush this way in 2006 (50% vs. 34%); and somewhat more view Obama as trustworthy (43% vs. 35%). On these two traits, the positions of Republicans and Democrats today are nearly the mirror image of 2006. However, Democrats are less likely to describe Obama as a strong leader and able to get things done than Republicans were to ascribe these traits to Bush eight years ago. 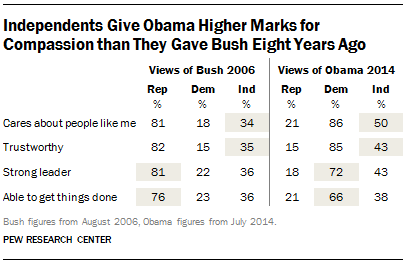 In 2006, 81% of Republicans said Bush was a strong leader and 76% said he was able to get things done. Today, somewhat fewer Democrats call Obama a strong leader (72%) and say he is able to get things done (66%).